Rated PG-13 for some thematic elements and language. Brit wit Stephen Fry once said of Judi Dench, "Railings should be built around her so that all may admire her in an orderly and respectful fashion." The occasion is the Golden Jubilee celebration held in 1887 to salute her 50 years of rule over the British Empire. After all the royal celebrants in a cavernous dining hall are seated, Her Majesty—a pudgy figure attired in a heavy black gown that droops like a curtain over her ample backside—slowly waddles her way to the head of a table. Her joyless face is as shriveled and sour as an ancient grapefruit as she wordlessly goes about the ritual as swiftly as possible. As the first course is served, she shovels soup into her mouth at such a rapid pace that liquid sloppily cascades down her chin. Later, she swiftly gnaws through a poultry course like a ravenous lawn mower before sneaking in a cat nap before dessert. Meanwhile, protocol requires that once she is done with a dish, others must cease eating as well. But Victoria’s frown is soon turned upside down when two of her Indian subjects, uprooted from their colonized homeland for the occasion, present her with a ceremonial coin. Both have been warned to not look directly at the queen and Mohammed (Adeel Akhtar, who emits an amusing Paul Giamatti level of disgruntlement), the older and squatter of the pair, follows the rules. But Abdul (Ali Fazal), tall, youthful and quite attractive with a merry twinkle in his eye, can’t help but gaze upon and smile at this lonely old woman. Suddenly, he bends down and kisses her foot. And, just like that, a bolt of mutual affection passes between the queen and the stranger who is about to become her closest companion during the waning years of her reign. That’s when director Stephen Frears, who did so well by Dench with “Philomena,” finally flashes—ta da—“Victoria & Abdul” upon the screen. Those who have seen “Mrs. Brown,” the source of Dench’s first of seven (to date) Oscar nominations, will be familiar with Victoria’s relationship with another commoner, Scotsman John Brown (played with robust cheekiness by Billy Connolly), after her beloved consort Prince Albert died. Their connection was more a meeting of the minds as her horse-riding partner would challenge her in a way that others did not dare. Most of her advisers treat the aging queen as an obstruction they are forced to indulge, especially eldest son Bertie (a frazzled Eddie Izzard, exasperation incarnate) who is anxious to be king. But what bonds the now-grandmotherly Victoria and Abdul, who has an elegiac way of speaking and viewing the world, is how he approaches her as a human being with feelings and not as an intimidating institution. He also serves as a conduit to India, a part of her kingdom that she is forbidden to visit since a fatwa has been placed on her head. His enchanting description of the Taj Mahal in his hometown of Agra leads her to build an elaborate Indian-themed Durbar meeting room in her seaside house on the Isle of Wight complete with ornate white ceiling, imported rugs and peacock throne. The script by Lee Hall (“Billy Elliot”)—“based on real events—mostly,” we are told—smartly allows moviegoers to discover along with Victoria just who this mysterious charmer actually is. Abdul appears to be forthright but will eventually be shown to be prone to omitting inconvenient truths about his past as need be. Initially, he is promoted to a kind of personal assistant. But as he helps the queen with her daily correspondences, she learns this onetime clerk at a prison is a Muslim and requests that he schools her in his native tongue of Urdu as well as in the Koran. When she learns the word for teacher is “munshi,” Victoria declares that will now be Abdul’s official position. As the queen grows ever fonder of and more reliant on her new soulmate, tensions rise among those in her inner circle including Michael Gambon as Prime Minister Lord Salisbury, Olivia Williams as Baroness Churchill and Paul Higgins as Dr. Reid, the queen’s personal physician. Race, class and out-sized privilege definitely play a role in stoking their shared resentment of being pushed aside by this foreign outsider to the point that an out-right mutiny is eventually threatened. The costumes, the gorgeous real-life settings and interiors, the just-right lighting, the music—all technical aspects are handled precisely. 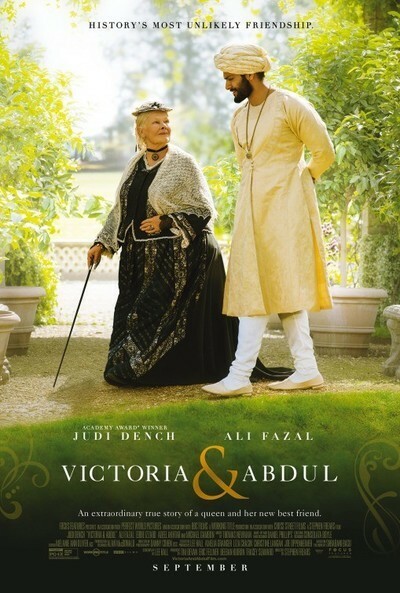 But if there is a problem with “Victoria & Abdul,” it exists within the imbalance between the movie’s titular twosome. While Fazal is well suited for his role physically and acquits himself as best as he can, there is no way he can come close to keeping up with Dench in the acting department. It is as if a cloud is pitted against a boulder. Despite that weakness, there are multiple pleasures to be had by witnessing a powerful, still-vital woman finding unexpected late-life joy of the platonic variety. Sure to bring a smile to anyone’s face is when Victoria and Abdul journey to romantic Florence, where Puccini himself (Simon Callow) sings for the queen and her entourage. In fact, the ruler returns the favor by straining to warble Gilbert & Sullivan’s “I’m Called Little Buttercup.” Much like this often-endearing portrait of an odd-couple relationship, it is a little off-key but well worth the experience.